Game of Thrones episodes come in two flavors: the ones that intensely focus on one plot, and the ones that quickly check in with every piece on the board. “And Now His Watch Is Ended” is, by that metric, an interesting animal. The piece-checking episodes take us on a nice tour of Westeros, but suffer from a lack of focus. This one, however, manages to touch upon everyone except Stannis, Jon, and Robb, and makes significant advancements for almost all involved. Let’s start with Jaime, who takes up most of this episode’s running time, and Bran, who doesn’t. This show really kicked off in earnest when the former shoved the latter out of a window, and that gets heavily recalled here. We see Bran climbing for the first time since the pilot, and it’s nice to see Isaac Hempstead-Wright do something other than look precociously stern. But while Bran rises, Jaime falls: right off his horse and into the mud. Last week’s episode was called “Walk of Punishment,” but the parade of humiliations visited upon him at the top of this episode were truly brutal to watch. After verbally bitchslapping the will to live back into him, Brienne asks why Jaime saved her. We the viewers don’t need to hear his answer (and he doesn’t give one), but it’s an interesting way to play with subjectivity. We’ve had three years of getting to know Jaime, while she only knows the notorious Kingslayer. To her, the kindness is a genuine surprise, but we’ve known since early on that he’s had it in him. The other character to get spotlighted in this episode is, of all people, Varys. I found the timing of Tyrion’s arrival a bit improbable, and I’m worried that tales of Pod’s rod will soon wear out their welcome as a running joke, but otherwise I found his plotline a fruitful addition not seen in the books. After two seasons of having him slink in around to offer wry commentary and cryptic information, we finally get to see a day in the life of a medieval spymaster, while digging deeper into his motivations. 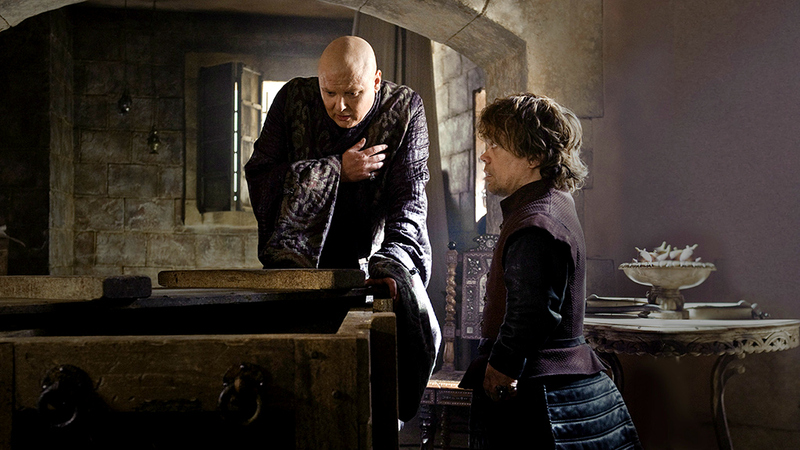 In public, Varys has maintained a position that he serves the realm, but this week’s episode demonstrates that this bears true even in private...especially if it means screwing over his biggest rival. Theon isn’t Varys, though he soon might be, if his captors get creative. I knew what was up with Theon’s rescuer the moment we first saw him, and I’ve watched with curiosity how the show’s adapted this particular storyline. I’m sad to say that I remain nonplussed. The reveal here is abrupt, in a Shyamalanesque sort of way, and until viewers know more about the boy with the slasher smile its impact will feel muted. While Theon’s been demoted from dramatic fulcrum to sideshow, the Night’s Watch are finally coming into their own as a subplot. The mutiny wasn’t foreshadowed as well in the show as it was in the books, but it made for a riveting scene nonetheless. There was brutal death all around: some sad (Jeor, whose death could’ve been an episode-ending cliffhanger by itself), some welcome (basically everyone else). What truly makes this plot exciting, though, is that it’s finally propelled Sam into a situation where he has to stand on his own. After two and a half seasons of bumbling about, he’ll finally have a chance to prove his worth as a brother of the Watch, and that should provide for some excellent television down the line. To my surprise, Joffrey’s proven eminently watchable this season. Jack Gleeson doesn’t get enough credit as an actor because of how naturally he embodies our little Caligula, but he adds great shades to his performance here. Even though viewers are privy to the Tyrells’ dealings, Joffrey remains oblivious, and it’s almost adorable how big a crush he nurses over a fiancee who’s figured out how to play to his sociopathy. The direction for their scene is excellent: his red clothes make him stand out in the blue of the sept, while Margaery’s blue ones make her a much more natural part of it. It’s a sly nod to Joffrey’s unnatural origins, one that only gets underlined when the gathered citizens of his home city first chant his girlfriend’s name, not his. I’ve taken a critical approach to all of the above, and the material is thankfully rich enough that I can’t even get to all of the things I want to say. But then there are things that just defy criticism. Things that tell you to just shut up and eat your awesome. Things like the last five minutes of this episode. Daenerys’ actions in Astapor are hardly a plot twist. Did anyone really believe she was going to give up a dragon, or for that matter become a slaver? And yet the scene was executed with such panache and confidence that it didn’t matter. It was a moment of tremendous dramatic catharsis, the likes of which Dany hasn’t seen since Khal Drogo was still alive. And the cherry on top? Her fluency in Valyrian. Just the right amount of buildup brought us to an appropriately sized fireworks factory, and Astapor got front seats to the flying sparks. I’ve tried, but I just can’t get into Downton Abbey. Diana Rigg’s work here means that now I don’t have to. The only one who can touch her talent for dismissive snark is Charles Dance, and a little bird (okay, a commercial) sings me a song that we can look forward to a sitdown between them soon. Olenna also makes fun of House Tyrell’s lame words and heraldry, an opinion I share. To explain a nerdy opinion by way of a slightly less nerdy opinion, House Tyrell is the Hufflepuff of Westeros. Beric Dondarrion, leader of the Brotherhood, was first briefly glimpsed back in season one here. It’s not just your eyes deceiving you; he looks different because he’s played there by a different actor. And also has two eyes. I enjoyed Cersei’s scene with Tywin, which paralleled nicely with the Tyrion one from the premiere. The show has much more explicitly underlined the similarities between Cersei and Tyrion, and these scenes only strengthen that.